I’m excited about a couple of upcoming movies that address issues of import in the 1970s. One is The Company You Keep, a film about a former 1970s radical who is living underground. Then his way of life is threatened and he goes on the run. The movie stars Robert Redford, Shia LeBeouf, and Susan Sarandon and is based on The Weather Underground movement. The other movie is Argo, starring Ben Affleck. This story is set during the Iran hostage crisis of 1979. 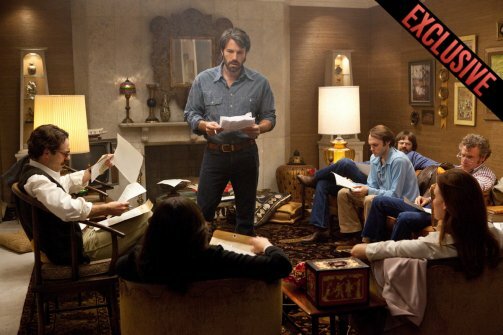 Affleck plays a CIA agent who puts together an elaborate plot to rescue Americans who are held hostage. The fact that these movies have been made suggests that the public is still intrigued by the drama of the 1970s. I hope this bodes well for another book I’m working on, which is about the Symbionese Liberation Army and one of its least-known members, Minnesota native Camilla Hall. I’ve done a lot of research on the 1970s and I still contend it was one of America’s strangest and most bizarre decades. You want drama and narrative and compelling action? Look no further than the 1970s. I was alive during part of the 1970s but too young to remember much. I’m eager to hear from people who remember the 1970s well. Was it really as bizarre as I think it was? Thank you, Rachel! I especially appreciate that comment coming from a writer/researcher such as you. I have mixed feelings about the 1970s. I was born in 1960 and had two siblings born in the early 1950s. As for casual trends, the fashions of the ’70s, to me, were no more or less horrific than many other characteristic decade styles. Frankly, I’m more put off by some of the big-hair ’80s coiffures and ultra-pleated ’90s pants (guilty of the latter, but not the former). In more serious terms, when I was a teenager, I too felt the loss of what I had perceived as a child – ’60s radical idealism and passion. One observation is that the ’70s was a boomerang reaction to the ’60s – granola hippies in ragged jeans and rainbow headbands replaced by a white-suited, disco-dancing Tony Manero. Thick-rolled joints replaced by lines of cocaine. Having lived through it, though, I’d say point of view is key. I realized I was a lesbian in the early 1970s. Much of my personal memory of that decade involves developing a lesbian feminist political perspective without benefit of the Internet, popular media, or peer support groups (until college). It was natural that I looked to the late ’60s for inspiration. And in fact the ’70s witnessed a blossoming of lesbian feminist politics, writing, and music, the memories of which I hold dear. So in that way, for me, it was not at all the wasteland some others experienced. By the way, I came to Rachel’s blog because of her research on Camilla Hall of the SLA. The SLA and Camilla in particular were of acute interest to me at the time they were in the news. I wrote quite a few songs, a couple of lengthy stories, and nonfiction commentary inspired by those events and the members of the SLA. Even as an adolescent I felt that the SLA represented the vestiges of ’60s political idealism gone extreme, birthing itself in the early ’70s as an inevitably awkward, lonely outsider, doomed to be obliterated. Karen, thanks for sharing your perspective on the 1970s. I have certain ideas in my head of that time, but that is based on only what I’ve read. It’s really helpful to hear personal stories. I often wonder what Camilla would have thought of that time period and I wish she would have hung in there. She found a much more welcoming community in the Bay Area than there was in the Midwest, but she still had to live a secret because she did not want to come out to her parents. I think she would have really came into her own as the 1970s progressed. I’m also a little sad because her parents loved her so very much and while they may have been disappointed because of their religious views, I have no doubts that they would have continued to love her and accept her fully. I agree that Camilla would have found her place as a lesbian, and most likely found the courage to approach her parents, if she had been able to pull through. Having come out in the Midwest in 1976, as a 15 year old, to Baptist parents, I totally get her angst over that choice. For perspective, I remind myself that when Camilla herself was 15, it was 1960. Needless to say, religious parents/Midwest/*1960* is waaaaay different. I also have no doubt that her parents would have loved and accepted her no matter what. I’m very sad about some of her choices and the path on which they led her – much in the way I am sad about young gay people who, even today, can feel isolated and alone, fearful of rejection, sometimes losing their lives in the process. I know that being gay was by far not the only challenging issue with which Camilla had to deal, but the difficulty of trying to process it and find self-acceptance must have played a significant role in her life. This is really well put, Karen! I was born in 1955 so went to high school in the ’70s and to college. I HATED the ’70s. To me, the nation was trashed after the ’60s. The center did not hold; there was a lawless feeling. Inflation was stratospheric. Clothes and hair styles were ugly as hell. Now I can really appreciate the movies and music and some books, but at the time it was just the way it was. Thanks for these insights! I’m sure you’re not the only one who hated that decade.